Students of Sheikh Zayed International Academy (SZIA), Islamabad enthralled the audience with sparkling set of traditional dances and vibrant performances to mark 39th anniversary of United Arab Emirates (UAE) National Day in Pakistan. Playgroup children waving flags of UAE and signing poem. The colorful event, held on Tuesday was attended by His Excellency UAE ambassador, Ali Saif Sultan Al Awani and a large number of diplomats, parents as well as students who were pleased to see musical performances of especially young students. The ceremony started with the speech of Ghanim Ali, (a student) in Arabic language on behalf of all the students of the school to pay tribute to UAE on 39th national day of the country. In the first performance, few students of play group presented a classic cultural dance while waving flags of UAE. The adorable act of the young performers was followed by a visual presentation of nursery students highlighting the culture of UAE by dressing up as camel and falcon. The next cultural act depicted the lifestyle of UAE showing women in long black gowns while men in long white dresses with a white and red checkered head-dress. The alluring performances reflected life of UAE allowing the audience to catch a glimpse of the glorious past and magnificent present day life of UAE. In the meantime the UAE ambassador, Ali Saif Sultan was honoured with a token of appreciation by Wafaa Abdul Ghaffar, the Principal of the school. ‘Gulf night’ – fashion show was another sparkling performance by students of grade 1- 4 including a catwalk of young students as a ramp model along with their pets. The little models overwhelmed the crowd with their self-confidence and the display of a charming performance. The next act represented a traditional wedding ceremony of UAE in which a number of participants adorned in beautiful glittering costumes impressed the spectators. 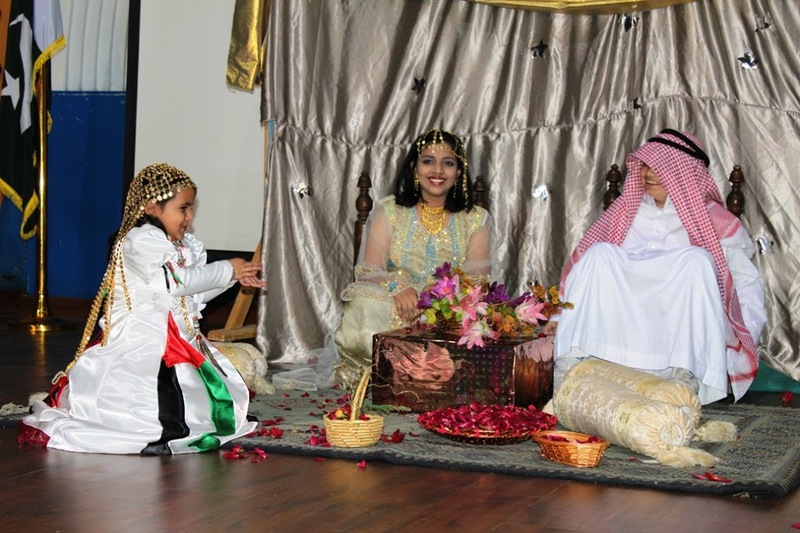 Students presenting a tableau on traditional wedding ceremony of UAE. In an energetic dance performance, senior students swayed their body with the rhythm of the beat and displayed dance gimmicks which received a huge round of applause by the crowd. Talking to Pakistan Observer, Saleh Abdulrehman of Kuwait Embassy said that he find the event remarkable. “I feel like home here. All the performances were well organized and quite attractive” he commented. A unique presentation on childhood games amused the audience in which a number of students in multi-colored clothes remain engaged in different games with friends. A documentary on the landmarks of UAE was also part of the programme. SZIA is a member of green school programme making it an environment friendly. WWF members were also present at the occasion to bestow the school with an opportunity to learn ways of recycling. 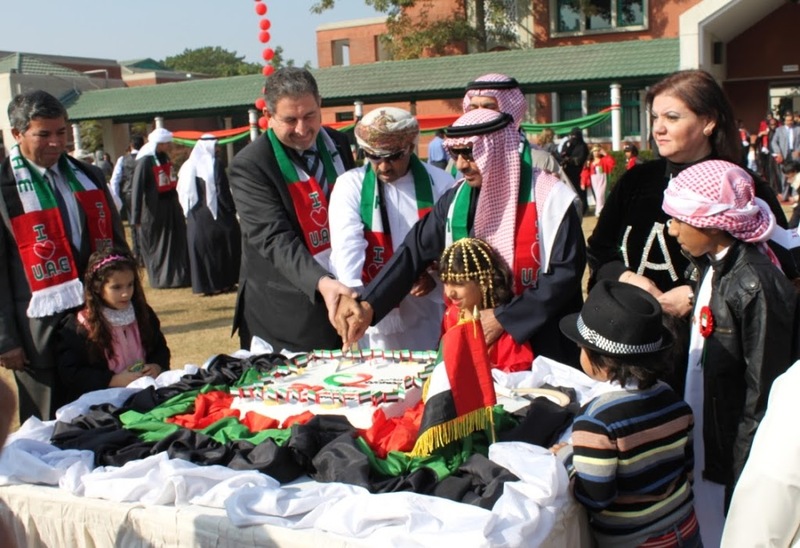 UAE Ambassador Ali Saif Sultan Al Awani alongwith Principal of Sheikh Zayed International Academy, Wafaa Abdul Ghaffar and other diplomats to mark 39th UAE National Day at Sheikh Zayed School, Islamabad.